5-Stroke Engines - What are these things? What is a 5 stroke engine? Why aren't they using them in vehicles right now? Is this a new thing or has it been around for a while? They tend to consist of only three cylinders rather than the more traditional 4 stroke, 4 cylinder engines that many people are using today. There are two small small high-pressure cylinders and one larger low-pressure cylinder. This video has some good information and animations. Increased manufacturing costs due to the fact that it is not widely adopted, also referred to as the "early adopter tax"
an unusual model called the Compound with three cylinders. 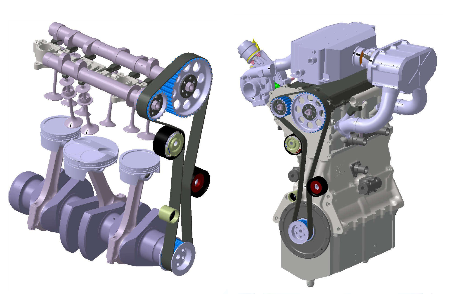 Two were working cylinders, the larger middle one further expanded the exhaust gases of the outer working cylinders, this concept received later the name: '5-Stroke engine'. Not the answer you're looking for? Browse other questions tagged engine engine-theory or ask your own question. What are the risks of overfilling a small engine with oil? What is happening when a two-stroke engine is said to be “four-stroking”? Two-Stroke vs. Four-Stroke Diesel Engines - What is most commonly used in heavy vehicles? Two-Stroke Diesel Engine - Do they use forced induction on them? What makes two-stroke engines less fuel-efficient than four-strokes? External Combustion Engines - What are these things? Steam Engines - What are these things? Natural Gas Engines - What are these things?